Hello good people and welcome to my somewhat offset 365 project. This is a page about me, I am many things including and impromptu artist, a photographer, an engineer and document writer, a Morris Dancer and an avid hat wearer! Update on day 158: I would quite happily say, that as well as those things, I am absolutely and exercise and fitness obsessive! I love it and am all about trying new and exciting ways of getting fit as well as tried and tested methods! Running through all of this is the desire to create things that people like to look at/watch/read/secretly laugh at (well…this is always a possibility when you wear a top hat to tescos). I just want to make people smile who read this blog, or at least think…but mainly I want to tell people all about the exercise I am doing so I keep on doing it! Good luck to you on this journey! Love that you decided to start midway thru the year! I’ll be cheering you on the entire way. It’s day 219 for me, and still going strong! Thank you 🙂 I needed to strike while the motivation was high and midsummer seemed as good a day as new years day and without the pressure! Obsessive is what the lazy folk use to describe the dedicated. 😉 Keep up the awesome work! I will read your post and find out what I have to do to accept the award! I’ve worn a tuxedo to 7-11. Laughter is almost always good. Pingback: dancing into the light | my year[s] of sweat! Exactly! I am not about telling people how to live their lives, just share some of the craziness that is mine and hopefully amuse them just a little bit! Love you blog madam, positive, original and inspiring. I kept finding your comments on blogs I follow and they made me giggle muchly, (i think the latest one was something to do with gin flavoured honey) so thought I’d best ramble on over and take a peek. Best of luck and keep it up! Write on. S. X.
hello and welcome to my vaguely exercise related ramblings! Good to see you here! Ahh yes…gin flavoured honey, a marvelous thing marred only by the moral implications of getting bees drunk… and the possible waste of gin! 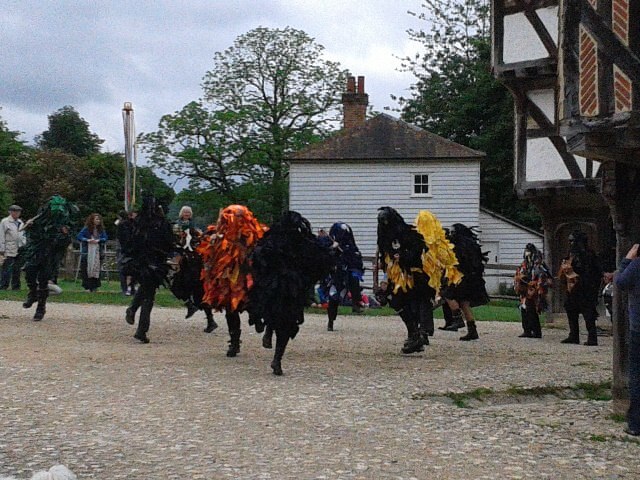 Just a thought, but as a Morris Dancer you presumably have a certain liking for folk music; I came across Mak’s blog a couple of months ago, which might interest you. This is the link to an almost random post, but he has many more in the same vein. And he doesn’t have many followers, because the world is a strange and lonely place.